The cornerstone of Summer’s role in the movie Thank God It’s Friday, “Last Dance” introduced a new structure for her songs: it starts off as a slow, torchy ballad, until more than a minute into it, the disco beat kicks in. (On its album version, there’s another slow breakdown in the middle.) It was kind of brilliant of its writer, disco weirdo Paul Jabara, to corner the market on club-closing songs, too. Anyone who suspects Summer was less than a magnificent singer is directed to the jaw-dropping note she holds forever to introduce the first chorus here. Anyone who suspects she was less than a magnificent songwriter is directed to the writing credit, which lists her name alone. The newly recorded title track of the greatest-hits collection that was Summer’s third consecutive #1 double-album also marked the end of her classic disco period–she left Casablanca Records immediately afterward, and her next big hit would be “The Wanderer,” which was closer to rockabilly than to anything that would be played at Studio 54. It’s fitting, then, that it’s a sort of tribute to the path on which Summer had led disco, from urban clubs to airwaves everywhere. 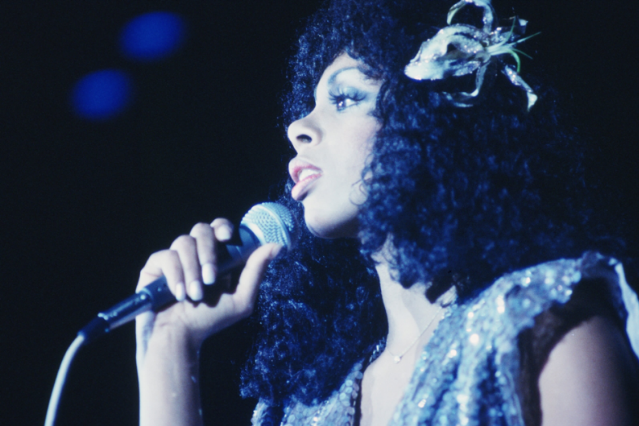 After he’d produced Michael Jackson’s Off the Wall, producer Quincy Jones made one album, Donna Summer, with the singer, who was casting about for a new direction. This single, co-written by Jones and Rod Temperton, was a substantial club hit and made the U.S. Top 10. It’s all but forgotten now, but it’s fascinating as the missing link between Off the Wall and Thriller, as well as one of Summer’s more aggressive performances. Thirty-three years after “Love to Love You Baby,” Summer returned to the No. 1 spot on the dance charts with this bilingual Spanish/English track — a feat she’d repeat three more times over the next few years. The song’s structure and touches of Sebastian Morton’s production suggest Summer’s disco-era hits, but the beat is straight-up contemporary club, and Summer’s performance is as impassioned as ever.